Shillatown can be considered the human race village and one of the strongholds versus the Kobolds. 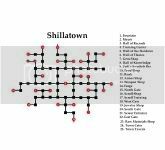 Shillatown will be your character's most frequent destinations, no matter where you roam. DON'T ATTACK THE TOWN GUARDS! They will kill you very dead. Only a few are strong enough to survive an attack, and they are reported to have a billion life. I would imagine that the Town Guards will only strip you of your on hand experience and leave you with only 1 gold even when successful at killing one of them. To get your character more familiar with Shillatown the Mayor sends you on two quests. The first, Exploring Shillatown Part 1, takes you to the Weapon Shop where you receive a knife. The second, Exploring Shillatown Part 2, takes you to four different locations within Shillatown: Armory, Food Shop, Scroll Shop, and the Jewelry Shop. One spot west of the Hotel is a location of one of the lost Brothers of the Light, one of the four Brothers you need to find to complete that Quest. Click on the thumbnail to open the map in a new browser tab/window. 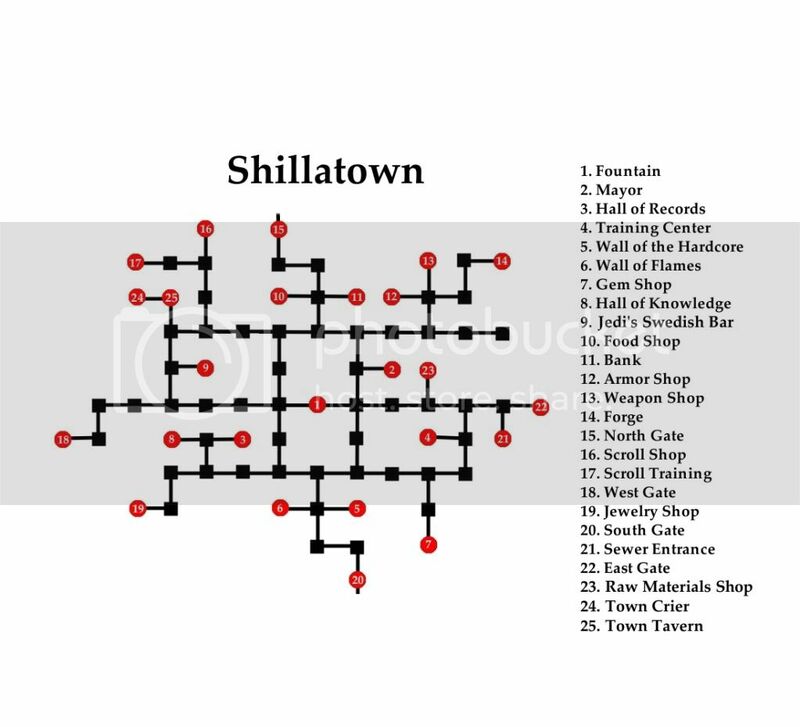 Here you will find a list of locations within Shillatown and the directions from the Fountain. These can be quickly copied and pasted into Chat Window. Information about all these location can be found HERE.